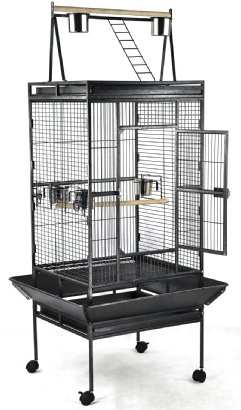 Give your parrot a luxurious home to call their own with this Lookout Medium Bird Cage - the open top provides hours of outside-the-cage entertainment while the stylish cage feel extra roomy for your large bird. 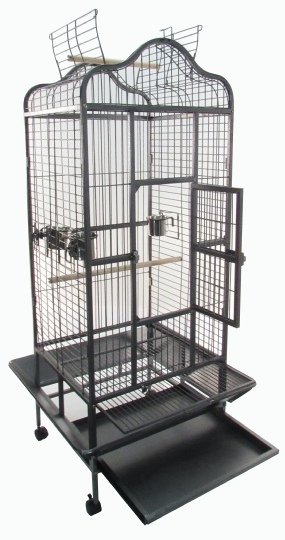 Featuring a sturdy, wrought iron construction and non-toxic powder coated colors, this spectacular bird cage also comes equipped with stainless steel food and water trays, and natural wood perches. Before your bird moves in to their new palace, you'll enjoy easy assembly that will last for years. Maintaining the large bird cage is also a easy, thanks to a removable slide out tray and flared seed skirt to keep debris at bay. 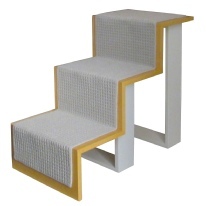 If your bird is looking for a change of scenery, simply move it along with the built-in stand on casters. 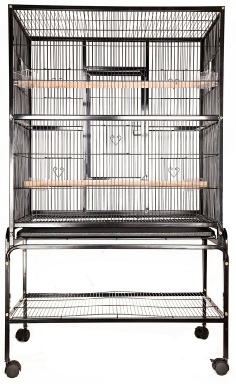 Ideally sized for large birds such as African Greys, Cocaktoos, and Macaws, this bird cage is a slice of affordable luxury your feathered friend will truly love. Solid cage, really like the open top concept, delivery was fast with in 3 days. Would recommend this to anyone that is looking for a good sturdy cage, delivery was fast, with a tracking number, cage came in one heavy box, really happy with this purchase. 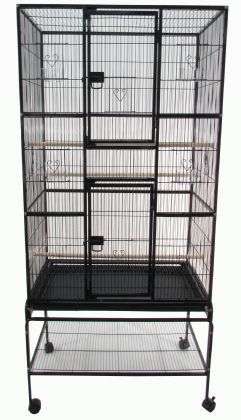 Good quality cage that is beautiful enough to have in livingroom. Rollers make it easy to move cage from room to room. Easy to put together. Impressed with fast delivery. Well worth the money! My bird really appreciates the space. Excellent size for a cockatiel. The catch around the side was a little bent providing a challenge when putting it together but nothing that couldn't be fixed. This cage is perfect. I wasn't sure what to expect, because it is much cheaper than other similar cages on the market. However, it came in perfect condition and assembled quickly.